Need for Speed World, formerly known as World Online until February 5, 2010 is one of the three next installments in the long-running racing video game franchise Need for Speed published by Electronic Arts, this iteration being co-developed by EA Black Box and EA Singapore. World is a free-to-play MMORG, or massively multiplayer online racing game, the second MMORG in the Need for Speed series after Motor City Online. EA marketing manager Keith Munro states that "this Play for Free action racing game will give Need for Speed fans the most licensed cars, parts and game modes ever in Need for Speed's history". There is now an official trailer, which confirms Pagani Zonda, Lamborghini, Porsche, Lexus and the return of the police. The game will continue the story where Carbon and Undercover left off. A beta test was held in Taiwan, 2009. On February 5, 2010 the first closed beta was released and there have been at least five more betas since. The release date is scheduled for July 27, 2010, however those who ordered the World Starter Pack had a head-start a week earlier. The game ultimately received lukewarm/mixed reception, with a MetaCritic average of 61/100. The game offers the ability to start crews, as such an official NFSUnlimited.net World Racing Crew exists. You can apply for it at this forum topic. The game has actually been in development for four years, prior to Carbon but intense devotion to finishing the product didn't begin until sometime late 2008. In an interview with World producer, Scott Henshaw, he mentioned that the European and North American versions of the game will have differences from the Asian one. It was also confirmed that the game will feature the cities of Palmont and Rockport, which were featured in Need for Speed Carbon and Need for Speed Most Wanted respectively. The cops were confirmed to return as well, together with a co-op and team based cop play. It is unknown if the game will have more cities and/or dynamic day/night cycle, but current screenshots show both daytime and nighttime. 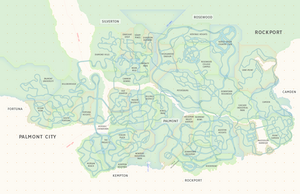 A map was recently released, showing Palmont and Rockport connected. The game will also feature a chat option and autopilot. The December 2009 NFSUnlimited.net podcast also confirmed that this installment will feature the largest selection of cars and parts in series history (so far 250 cars have been planned from Most Wanted, Carbon, ProStreet and Undercover). As mentioned before, the gameplay style is based on that of Most Wanted and Carbon featuring high speed street racing, tuning, customization and police chases with various MMO elements. The setting is Rockport and Palmont merged together. This time both cities are available in day and nighttime. Racing crews can be started (originally seen in Carbon). A key gameplay element is the power-ups, which has drawn comparison to Bizarre Creations' cult arcade racer Blur. 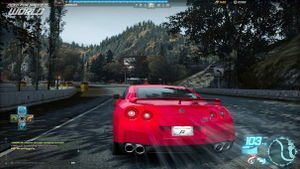 Before September 8, 2010, after reaching level 10 and access to only tier 1 and certain tier 2 cars, the player would not be able to progress further in the game and would cease to earn any more experience points or cash. 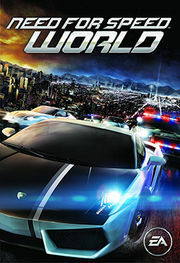 To continue the game, the player had to purchase the Need for Speed World Starter Pack. Without it, the player was allowed to play the game for as long as he or she wants, but he or she would cease to earn experience and cash. This initially disappointed many fans, however on September 8, 2010 World had passed 1 million registrations. To celebrate that, the game was made free-to-play and the level cap was removed.